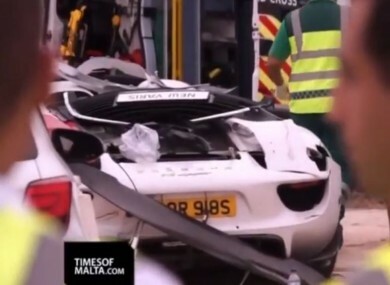 FIVE PEOPLE HAVE been critically injured after a supercar sped off the track and crashed into the crowd at a motorshow event in Malta yesterday. 21 other people were also injured, the Times of Malta reports. Amongst the injured are a six-year-old girl and her mother. Video footage showed the Porsche spinning out of control at speed on the track. “The car was speeding down the taxiway when a back wheel went on the grass,” one eye-witness told the Times of Malta. “The car spun out of control, went through the barriers where a large crowd was watching, and into the area of the static car exhibition,” the eye-witness said. A fleet of ambulances and a medical helicopter were sent to the scene. 19 people were taken to hospital, while the rest were treated at a local health centre. Organisers have said the cause of the crash will be investigated. Email “Five critically injured as supercar spins off track and crashes into crowd”. Feedback on “Five critically injured as supercar spins off track and crashes into crowd”.